Jicama (pronounced – hicama) is a sweet tasting root vegetable. It is a popular vegetable in Mexico and is often sold prepared this way by street vendors. When shopping for jicama look for small to medium sized ones (about 2 pounds) that are firm as they will taste more sweet. When jicama get larger they are more starchy and woody. Peel the tough outer layer with a small sharp knife. Sometimes they will be coated with wax making them a little difficult to peel. Cut into sticks for this recipe or dice some to add to salads. You will love the sweet crunch it adds to salad greens or a slaw. Yum! 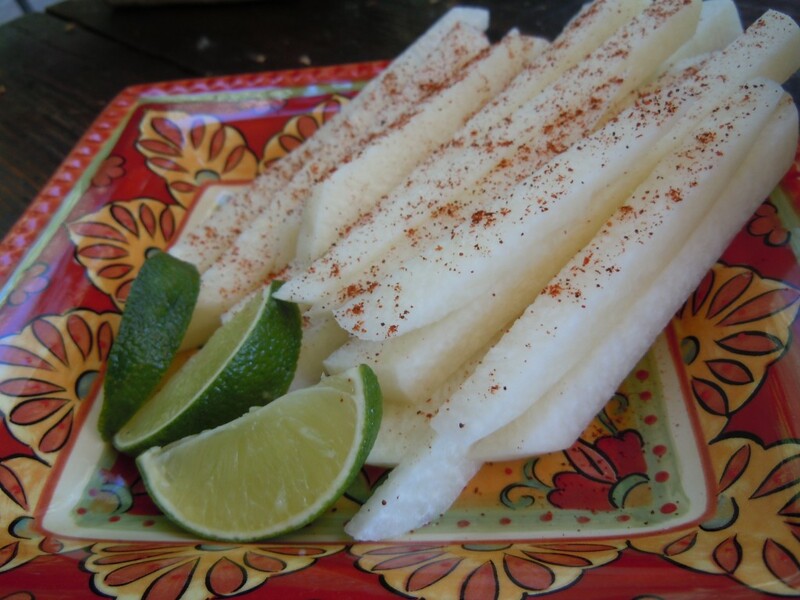 Squeeze fresh lime juice over prepared jicama, sprinkle with chili powder – to taste. Crunch and munch to you hearts content! Serves: Approx 6 – depending on the size of the jicama. When choosing jicama the ones that are not symmetrical are sweeter. Chose the ugly ones.